A major campaign is underway to encourage Santa Clarans to vote for a football stadium (Measure J). We oppose the stadium because we believe that public money should be spent on the public, and any private investment of public money should have a positive return on investment. The following are the top ten reasons why we oppose the 49ers stadium subsidy. An explanation and information source is provided. Measure J will result in a net $67 million loss to the City's General Fund. Funding for Santa Clara Unified School District comes from the city's Redevelopment Fund, not from the 49ers or the Stadium. Measure J extends the Sweetheart Rent Deal on the 49ers Training Center -- they pay only 1% of what other businesses pay the City. Most Stadium jobs will be part-time and low wage, the construction jobs are temporary and fewer than 7% will go to Santa Clarans. Tax Money will be spent on the stadium, despite the 49er's campaign claims. The 49ers' claim that they will pay operations and maintenance costs has a major loophole. The 49ers can decide to bring in the Oakland Raiders, even if the city opposes it. Measure J will result in $6 million less being spent on affordable housing. Measure J commits the City to a 2-TO-1 LOSS on our Investment. Reason #2 - Funding for Santa Clara Unified School District comes from the City's redevelopment fund, not from the 49ers or the stadium. The 49ers urge Santa Clarans to vote for Measure J "for our schools." But their marketing campaign creates the impression that the additional funding for the Santa Clara Unified School District (SCUSD) comes from stadium revenue or from the 49ers. It does not. The money actually comes from property taxes paid into the city's redevelopment agency (RDA) fund - the same fund we have used to pay for libraries, bike trails, and fire stations. The 49ers cannot take credit for providing this money - the money comes from Santa Clara taxpayers. This transfer of money from the City's RDA to SCUSD is because the duration of the RDA must be extended to fund the stadium so the City can take on new debt. In order to extend the RDA, state law requires more RDA money to SCUSD (but not to the Cupertino or Campbell school districts). SCUSD will get RDA money either way, they just get more with RDA extension. But the transfer of money is like "robbing Peter to pay Paul." SCUSD's gain of $21.7 million should be compared to the overall net loss of $67 million loss to the City's General Fund. And those who live in the Cupertino or Campbell school districts will not only see their city lose money, but will also get nothing for their schools. Source: Memorandum to Ron Garratt, Assistant City Manager from Keyser Marston Associates, June 2, 2009 . Reason #3 - Measure J extends the sweetheart rent deal on the 49ers' training center - they pay only 1% of what other businesses pay the city. The 49ers only pay us about $26,000 per year for rental of 11.2 acres of city land - less than many Santa Clarans pay for their mortgage/rent. Three businesses near the training center pay the city $1.4 million, $1 million, and $.5 million per year for properties about one-third the size of the training center. This means that the 49ers pay about 1% per acre of what these other businesses pay. If the 49ers paid rent at the same rate per acre as these other businesses, they would pay the city $2,600,000 million per year, not $26,000. We see no reason why the city should provide bargain basement rent to the 49ers when other businesses pay fair market rent. The term sheet requires the city to extend the rent deal as long as the stadium lease is in effect, possibly until 2074. This cheap rent deal alone is worth millions to the 49ers and costs the city millions in potential General Fund revenue. The loss caused by this loss of revenue has not been calculated, and is in addition to the $67 million loss to the General Fund. Reason #4 - Most stadium jobs will be part-time and low wage, the constructions jobs are temporary and fewer than 7% will go to Santa Clarans. Most stadium jobs will only be available a few days per year and will not be highly paid. Construction jobs will be available, but will only last 31 months. According to the economic report, 93% of construction jobs will go to non-Santa Clarans. That leaves only 90 construction jobs for Santa Clara residents. 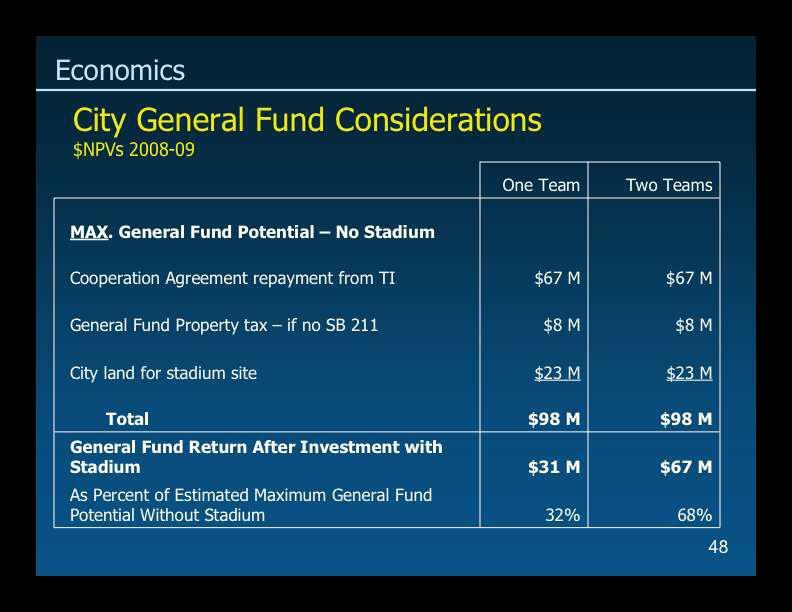 Reason #5 - Tax money will be spent on the stadium, despite the 49ers' campaign claims. The 49ers' bumper sticker states that there are "No Taxes." In fact, redevelopment funds are property tax dollars. Redevelopment funds can be and have been spent for projects that benefit all Santa Clarans like bike trails, libraries and fire stations. There is also a new hotel tax, much of which will be paid by Santa Clara businesses which lease out rooms to incoming business travelers. The utility funds which will be spent are not tax dollars, but they are money which belongs to Santa Clara residents. Finally, the stadium plan doesn't address how the city will replace the $67 million loss to the General Fund. Just because we haven't planned any new taxes now doesn't mean we will not have to in the future. The 49ers' consultants prepared a report which admits that the city's "economic activity" and "personal earnings" will increase by only 1/1000 as a result of the stadium. The impact on our city is a "drop in the bucket." Many Santa Clara companies provide much more to our city's economy, without asking for a subsidy or city involvement of any kind. Also, only about 1% of the stadium construction spending will occur in Santa Clara. 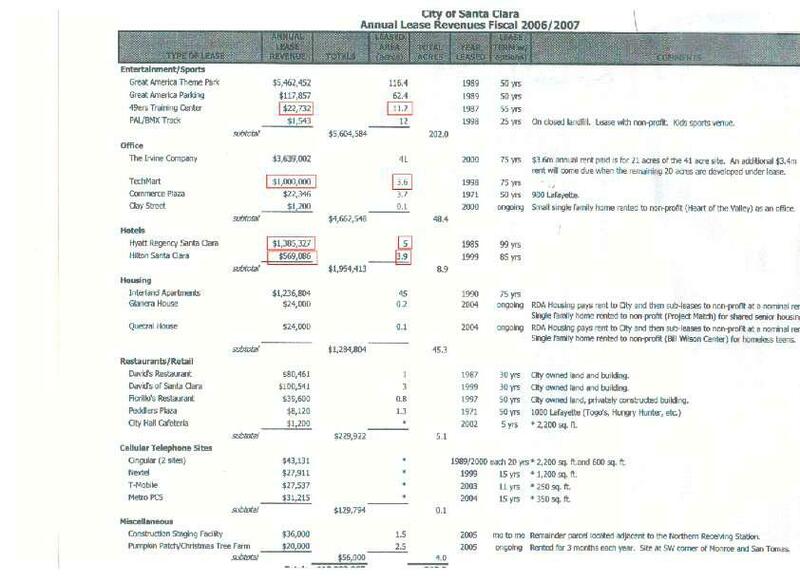 Source: Memorandum to Ron Garratt, Assistant City Manager, June 1, 2007. Reason #7 - The 49ers' claim that they will pay operations and maintenance costs has a major loophole. The stadium would be run by the "Stadium Authority," which would be a new branch of the city government. The 49ers, though, have the right to approve or disapprove the stadium budget. The 49ers are only responsible for paying operations and maintenance costs which they say are "reasonable." Disagreements are likely to occur as to what the 49ers have to pay for, especially as the stadium ages and expensive renovations are required. The city has no way to force the 49ers to pay more if the maintenance is insufficient because the 49ers make the final decision and will not submit to binding arbitration of disputes. It is not clear who would end up paying for repairs if the 49ers choose not to. A similar arrangement exists for public safety costs. The 49ers will pay a pre-negotiated amount for public safety costs. However, if the city has miscalculated, and doesn't have enough to cover the public safety costs, the 49ers cannot be required to pay more unless the shortfall results from specific new security rules which may be imposed by the NFL in the future. Reason #8 - The 49ers can decide to bring in the Oakland Raiders, even if the city opposes it. The city has surrendered its right to control whether the Raiders will move to Santa Clara in the future. The 49ers now have sole authority over this decision. Reason #9 - Measure J will result in $6 million less being spent on affordable housing. The stadium will take $6 million nominal dollars in redevelopment funds which otherwise would have been spent on affordable housing. Affordable housing is a city program which assists many first-time homebuyers and persons with modest incomes to purchase a home. Reason #10 - Measure J commits the City to a 2-to-1 loss on our investment. 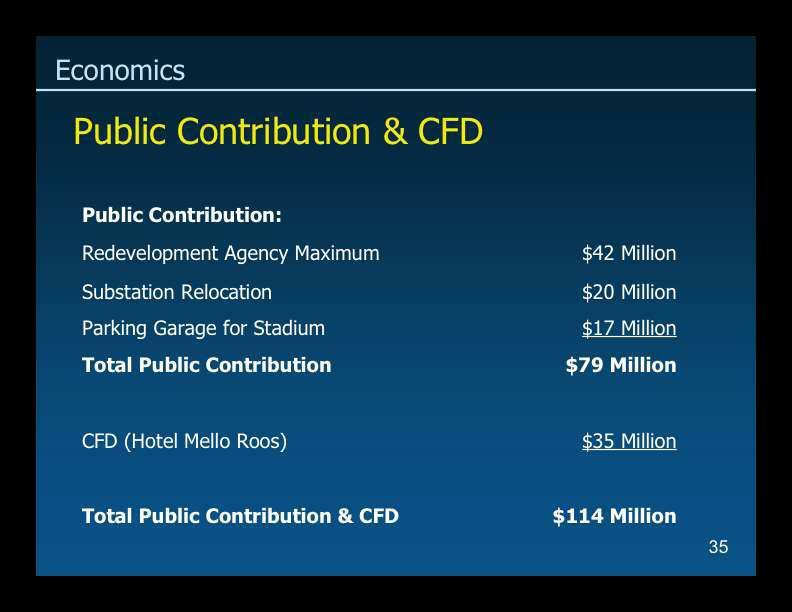 The city is required to direct $114 million towards the stadium project ($106 million net present value). This is made up of Redevelopment money, utility money, and hotel tax money. In addition, we must provide the land for the stadium and lose more money by extending the 49ers sweetheart rent deal at the neighboring training center. In return, the city receives well less than half of what it puts in - only $57 million in General Fund and redevelopment revenue over the 40 year lease. This is made up of rent ($8 million) projected profits from other events ($18 million) additional sale/property/hotel taxes collected ($29 million) and Senior/Youth Fee ($3 million). These values are in "net present value," or today's dollars. We don't see why the city should enter into a stadium deal which is projected to lose more than two dollars for every dollar taken in. The 49ers' claim that they pay "fair market value" on the stadium land ignores the fact that in order to receive rent, the city must pay an amount at the beginning of the lease which is worth far more than all of the future rent combined. Also, the majority of what the 49ers call "rent" is not guaranteed, and is not really rent. It is only the possibility of earning money from other events. You may wonder why the 49ers claim that they will pay $40 million in rent over the course of the lease, and we say it is only $8 million. The difference is that we use "net present value," which accounts for inflation, and the 49ers use nominal value, which does not. 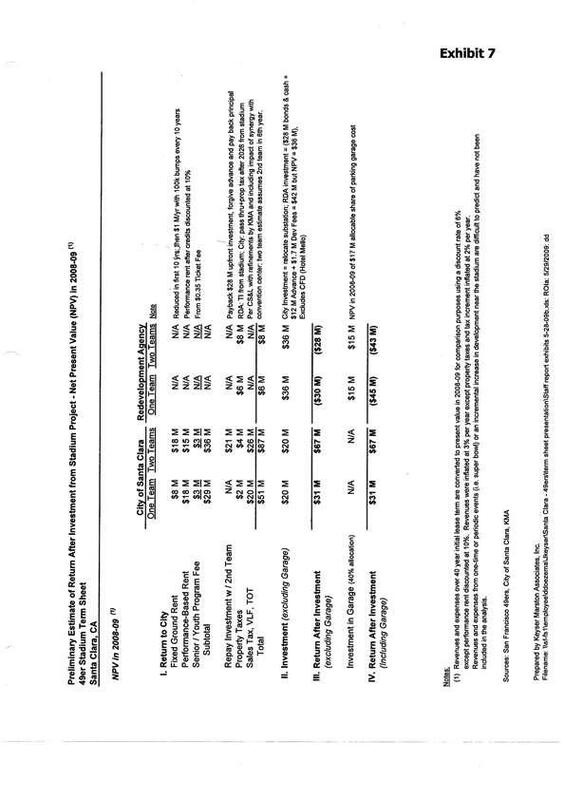 The city staff uses net present value. Because most of the rent will be paid many years from now, it will be greatly devalued by inflation. So the value of all of the rent which the 49ers will pay over the 40 year lease is only valued at $8 million by city staff. The same is true of "performance based rent" (i.e. the city's share of profit from concerts, etc.) 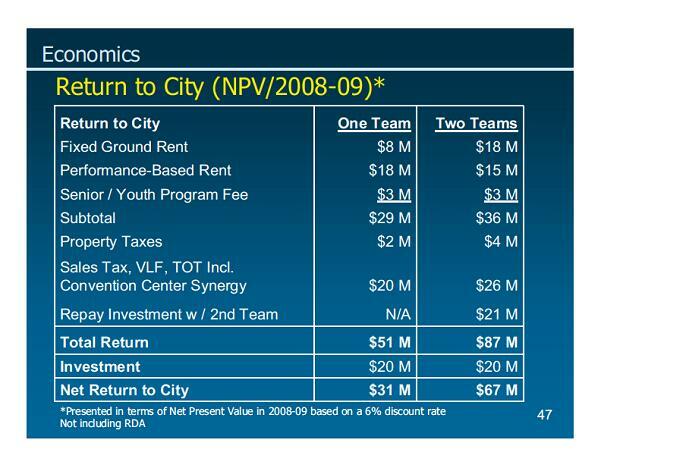 which the city values at $18 million, net present value, and the Senior/Youth fee which the city values at $3 million, net present value. The 49ers' campaign materials claim that these amounts are much higher because they use nominal values. Only by comparing the net present value of the costs and the revenues, can you determine whether the project will make, or lose money. 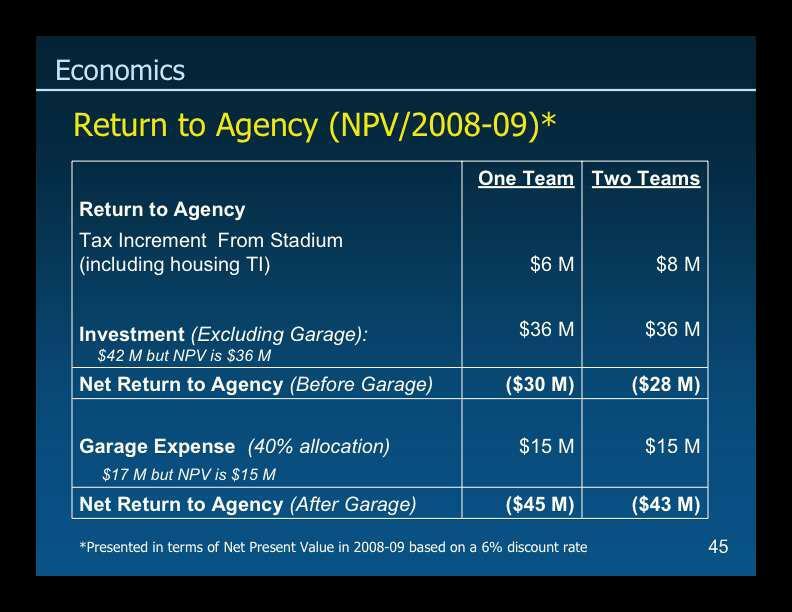 That comparison shows that the stadium loses money.